Last night, I posted a photo on Instagram of some of the documents that I was prepping for Open House and Back to School. Several people requested a blog post about what I send home with parents at the beginning of the year and here it is!! These documents have been a work in progress for me over the past three years and many of my ideas come from other teachers. 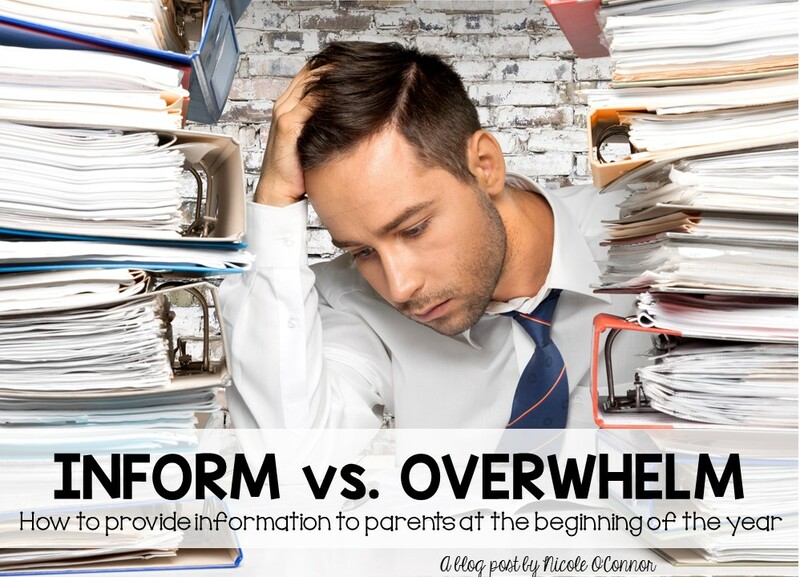 When I start planning my handouts for back to school, I always start with the mindset "Inform. Don't Overwhelm." I want to give my families the information that is necessary for the beginning of the year, but I don't want to overwhelm them. I figure that people are more likely to read and remember what I write if it is brief and informative. 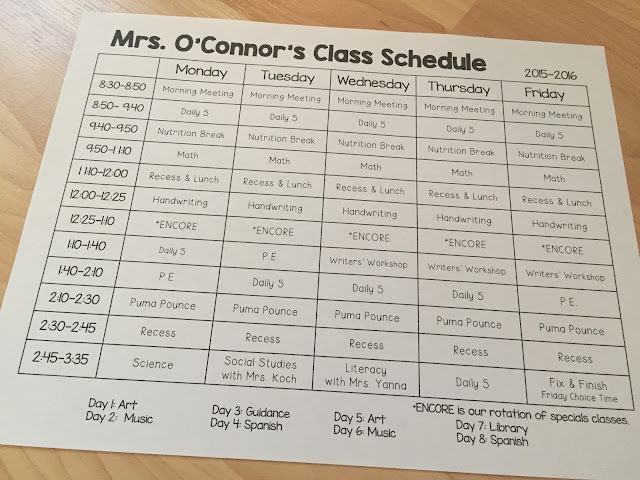 I had a professor in college who collected everything that was sent home in her elementary-aged son's folder throughout an entire school year. She brought the box into our education class and threw the papers all over the room. We sifted through the papers and so much of it was JUNK! Her point was that if we want parents to be involved and supportive, we need to be very conscious of what we are sending home. 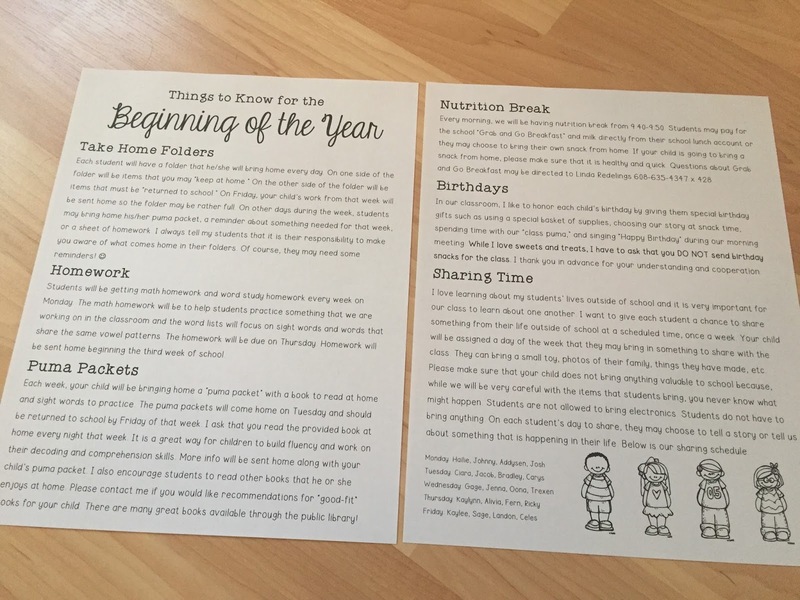 DON'T overwhelm them or give them too many flyers, just give them the info that they need to start the year successfully. Okay, so let's get to it. I send home information in three chunks... A letter to families that I send to each student's home in August, a packet of information at Open House (before school begins), and additional information at parent-teacher conferences in October. 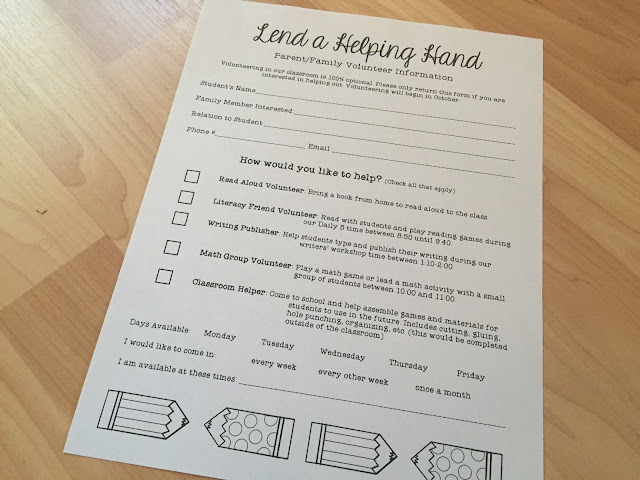 I've added links to some of my handouts throughout this blog post that you can grab for free. I also use handouts created by Cara Carroll at the First Grade Parade. 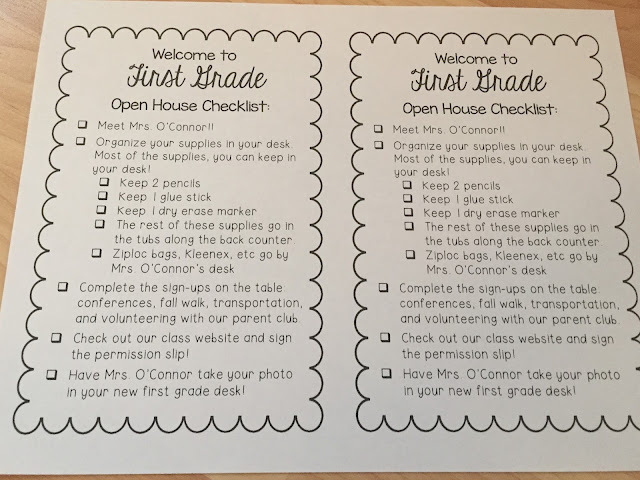 Here's a link to her blog post about Back to School Night. These three documents go into an envelope and I mail them to families about two weeks before school begins. 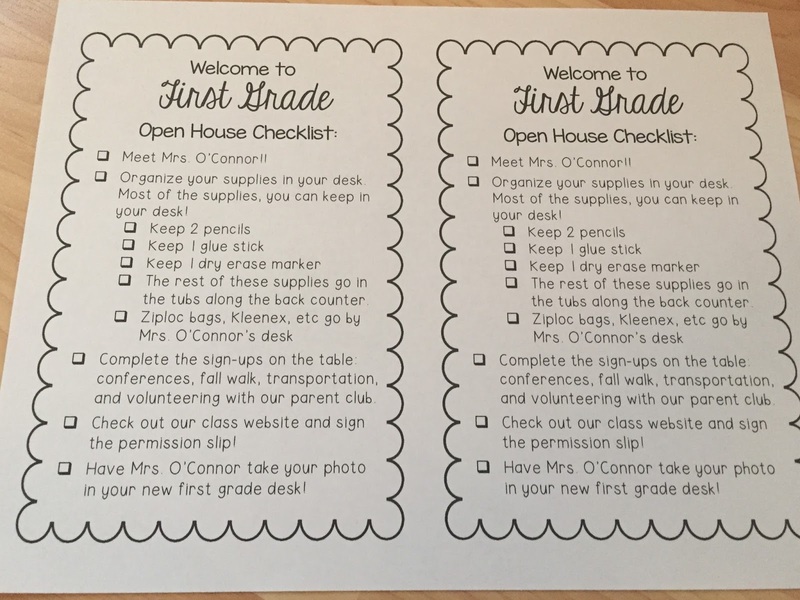 I send a brief letter introducing myself, a permission slip for our class website, and a reminder sheet about Open House. I send the permission slip about the class website because parents can check it out before Open House, if they are interested. Many parents even return the permission slip to me at Open House. Here's a link to my class website permission slip. On each student's desk, I have a little welcome bag for them with a few treats, a pencil, and an eraser. 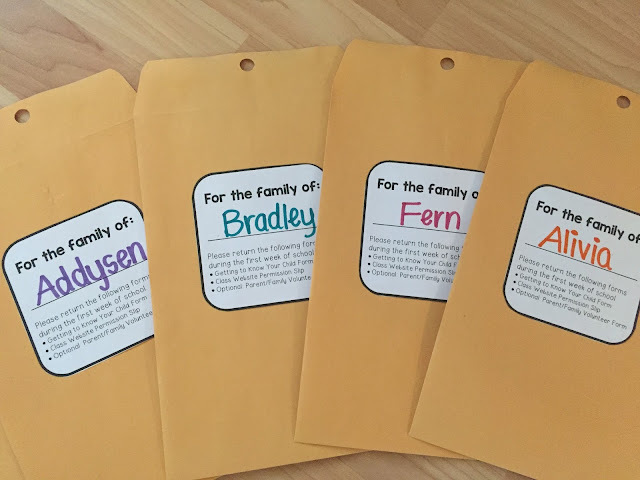 For families, I have a 6in by 9in manilla envelope with each child's name on it. The envelope contains all of my Open House documents for parents. The label also tells parents which papers need to be returned to school. Here's a copy of my labels. I stick them on the envelopes with two-sided tape. 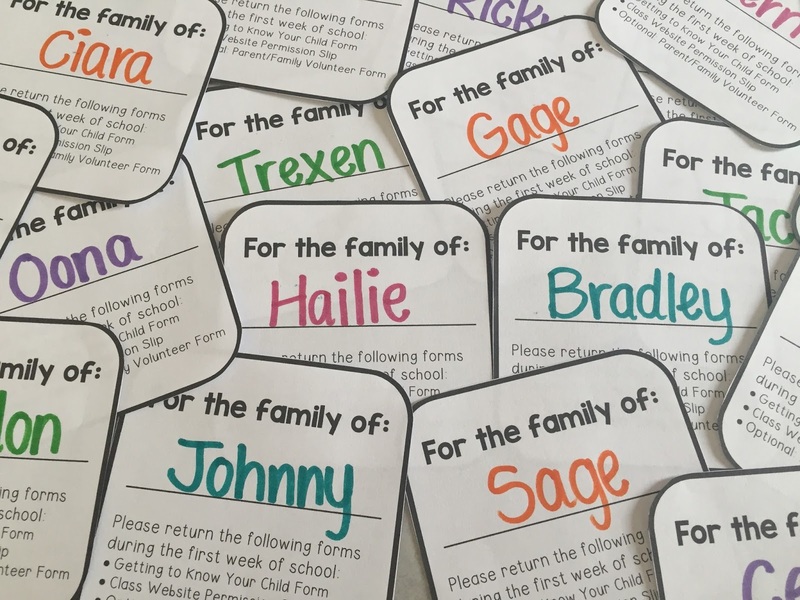 Getting to Know your Child Form: A basic questionnaire that parents fill out about their child. (included in Cara Carroll's Meet the Teacher document- see blog post here) I also print this one back to back. I'll leave you with a photo of my favorite part of Open House... taking each student's picture with our class puma. The kids LOVE him! He becomes a very special friend throughout the year. Oh, I can't wait to do this all again!! Comment below if you have any great Open House or back to school communication tips! !